The Current sensor ML23f is a general-purpose sensor to measure currents in AC and DC circuits in the range between -12.5 and +12.5 mA. 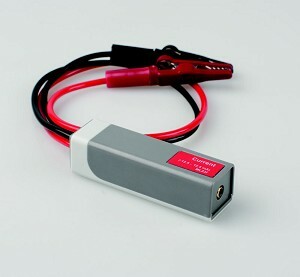 The sensor is equipped with two 4-mm banana plugs and two additional alligator clips are delivered with the sensor. The Current sensor should be placed in series with the circuit component through which the current is measured. Currents in either direction can be measured. The Current sensor has a very low resistance so that it introduces as little resistance as possible to the circuit. The sensor is protected and currents up to 25 mA will not damage the sensor but it never should be used for higher currents. • Measurements of internal resonance and EMF. • Together with a Voltage sensor it can be used to explore the relationship between the current and the voltage in electrical circuits. The Current sensor ML23f is a digital sensor (on-sensor digital conversion), which gives calibrated values of the measured quantity. This sensor can only be connected to the CMA MoLab interface and not to other CMA interfaces such as VinciLab, CoachLab II+ orf EuroLab.